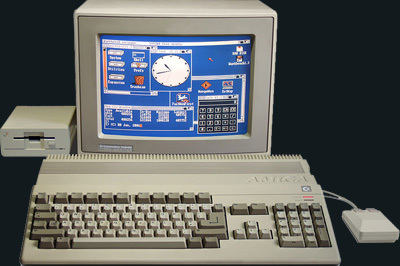 The Amiga took the home computing world by storm. Allegedly Atari approached Commodore with the aim of building a 16-bit computer together, Commodore agreed then, having pooled their resources, Commodore run off with the lot leaving Atari high and dry. The result was the Amiga and it was ground breaking. Never before had the public seen such beautiful graphics or heard such sound from a computer they could afford. Where the Amiga's direct competitor the Atari ST built a niche for itself in the music industry, the Amiga found a similar niche in the TV graphics industry which allowed it a longer than normal life. Amiga's were even being sold as cheap internet machines in the early 2000's. I'd like to say that the Amiga is still going strong today, it isn't but the Commodore brand now emblazons a range of gaming PCs. WinUAE - Advanced and complex emulator. Once mastered this is a fantastic emulator but don't expect to just switch on and play. Aminet - Repository of Amiga disk images. Amiga History Guide - An in-depth history of the Amiga.